All players are issued the impressive 0.68 calibre Tippmann 98 Custom Machine Gun on their day out with Delta Force, ensuring they go into battle with the confidence of an up to date paintball marker.  The Tippmann 98 Custom is a well-finished semi-automatic, rapid firing gun, that allows players to play with a lightweight and reliable weapon during the heat of combat. Moulded in a tough looking black finish, each gun is meticulously maintained by our team of gunsmiths who take pride in their work, and proud to share these amazing firearms with you. The comfortable design means you can easily move around the fields to execute your strategy and pick off the enemy one-by-one or, if you like, send a volley of paintballs their direction. Whether you are a one-shot one-kill type of sniper or a shoot-at-everything-that-moves type of commando, we’re sure you’ll find that this gun will satisfy your paintballing needs. Play with Delta Force for the ultimate paintball experience!